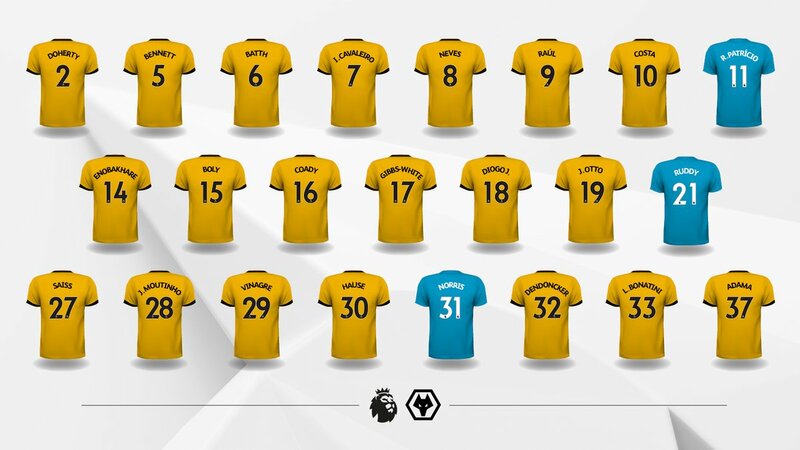 Newly promoted English Premier League club Wolverhampton Wanderers today announced the squad numbers for the 2018-2019 campaign. Rui Patricio did not receive the No.1 shirt to honor former Wolverhampton Wanderers goalkeeper Carl Ikeme, who was diagnosed with acute leukaemia and retired last year. Therefore he got the number 11 shirt (each of the 3 keepers have each taken the numbers ending in 1). Apart from Rui Patricio's number 11, the main news from Wolverhampton Wanderers' shirt numbers is that Helder Costa and Bright Enobakhare receied new shirt numbers. Costa has been handed the number 10 shirt, while Enobakhare will don number 14. New signing Raul Jimenez is number nine, while goalkeeper Rui Patricio will be number 11. 28 goes to Joao Moutinho and Jonny Castro Otto has been handed number 19. The full squad, showing the name and numbers which will be on each Wolves shirt, is listed below.